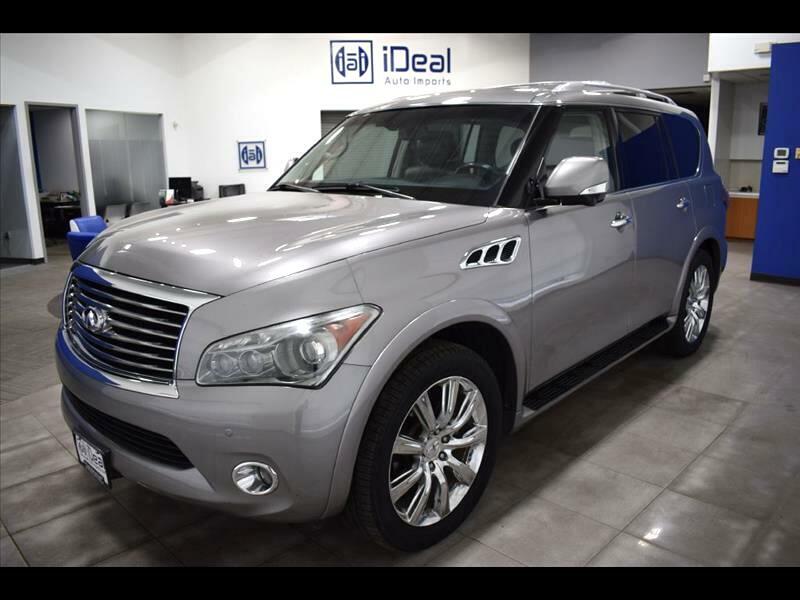 Fully loaded 2012 Infiniti QX56 AWD with Rear Entertainment System; Bose Premium Sound; Navigation; Bluetooth; Backup Camera; Parking Sensors; Moon Roof; Heated Front/Rear Seats; Heated Steering Wheel; HID Headlamps; Towing Pkg; 22 Inch Premium Wheels. Set of new Pirelli tires. Black leather interior with Gray Metallic exterior. Comes with 1 month/1000 miles limited warranty. Indoor auto showroom. iDeal Auto Imports, meeting your auto needs with quality and value! Conveniently located at 7980 Wallace Road. Eden Prairie, MN 55344, we offer a desirable mix of quality used import cars at competitive price. All of our vehicles are stored indoors, fully inspected, come with a free carfax report and backed up with powertrain warranty. Visit us online at www.idealautoimports.com to see more pictures of this vehicle.